1. Eat a Steckrl Fisch at the Fischer Vroni Zelt – There is nothing quite like a hot Mackerel right off the coals along with a giant pretzel all washed down by an ice cold beer or Weisswineschorle. Lecker! 2. 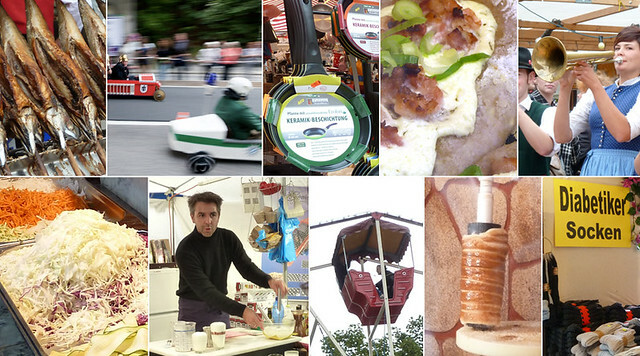 Watch the Seifenkisten Rennen – A good old fashioned soap box race that is a very neighborhood-y affair with participants from the local schools, grunge bars and police and fire departments. 3. Buy a frying pan – This is what is so strange and charming about the Auer dult, it is one part carnival, one part folk festival and one part housewares section at the hardware store. 4. 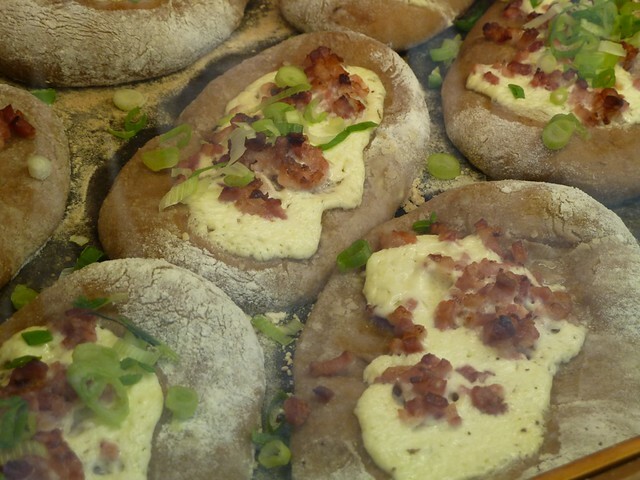 Eat a Ofenfrisches Rahmschmankerl – A flat, rye-tasting roll topped with a buttery sour cream sauce, bacon chunks and green onion, fresh out of the oven. Need I say more? 6. Learn how to make piles and piles of vegetable shavings with just one single kitchen utensil – It’s hard not to be seduced by the miraculous looking mounds of cabbage, carrots and onions…but then I remember that it’s only on the rarest of occasions that I’m asked to make coleslaw for a small army. 7. Enjoy the dying art of carnival barking – Whether you need a juicer, a microfiber towel, cleaning solution for your pots and pans or a potion to get rid of the rough patches of skin on your feet, these guys will explain why their products are going to change your life. Grab a snack and join the rest of the entranced crowd to listen and learn, these guys are professionals. 8. 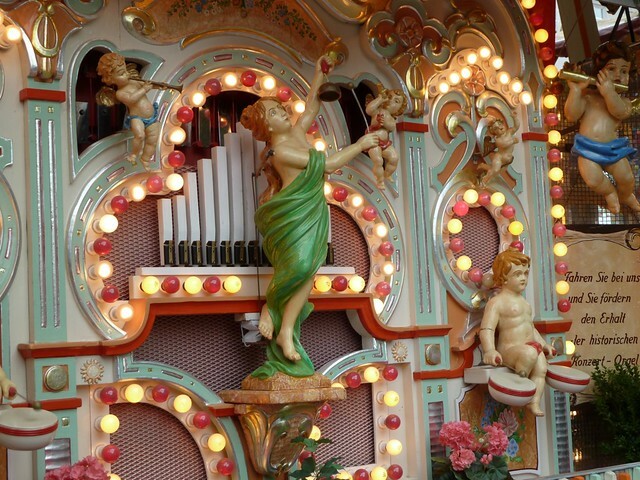 Ride the old fashioned mini Riesenrad – There are a lot of newer carnival type rides like bumper cars and swirling wheels that look not only unsafe, but sure to induce immediate vomiting, which is why I find is small vintage Ferris wheel to be so sweet and inviting. 9. Eat a Baumstriezel – Also known as a chimney cake. The dough is wrapped around a wooden cylinder and cooked in a spit, then rolled in cinnamon and sugar which is caramelized by the heat of the cake, making a hot sweet crisp crust. It’s madness, sweet, hot, cakey, delicious madness. 10. Buy some ‘Diabetiker Socken’ – Clearly the owners of this stand understand contextual marketing. I have no idea what these are, but I’m sure that by the time I’m done hitting all the food stands I’ll need a pair. More pix and commentary in the Wahlmünchnerin Auer Dult Flickr set. this is great! Although I have to say, my favorite FAVORITE part of Auerdult are the vintage alleys full of old bavarian stuff!!! especially the lederhosen stand, and the postcard ones.